SOLID METAL roleplaying dice, guaranteed to impress! Just imagine the look on your friend's faces when you turn up with this incredible, solid metal rpg dice set, in it's own specially crafted presentation tin. 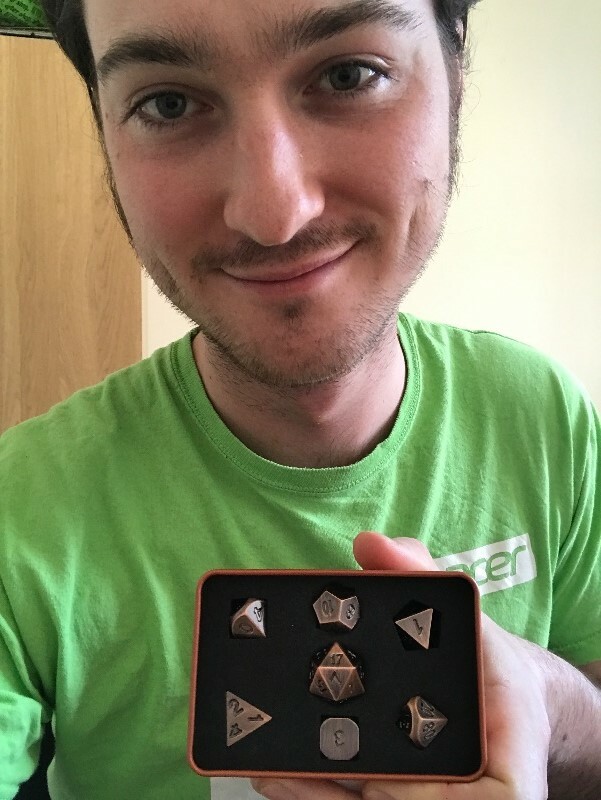 Paladin Roleplaying are proud to present the pinnacle of roleplaying dice - a full set of weighty, solid metal dice with a beautiful high quality antique bronze finish. The dice are made of a zinc alloy for maximum heft and weight, with a tough nickel coating to make sure that they don't chip or scratch. The tin has custom made foam padding with shaped holes for each die - A great display case, and also keeps the dice safe and secure. Perfect weight and look a work of art! These dice are a work of art. They look lovely, almost like antique bronze, but what really sets them apart is the weight, they're PERFECT. And well balanced, recommended! I love the feel of these dice. They're heavy and there is a great satisfaction hearing them thunder across the table top. The carry case is very swish - I much prefer it to a dangling sack that clicks in your pocket. Really amazing design! I bought both the steel & bronze coloured dice and I couldn’t have got better sets. As a DM, I found that I can easily put the fear of Bhaal in all my players every time the table shakes with my dice roll. When I smile (which is often) they know that my table shakers have crit ... Bwahahahahaha!!! The metal dice work so well! I love this set of dice. They feel nice and weighty, seem fair, and look amazing. Would definitely recommend.